An intraocular haemorrhage or vitreous haemorrhage is bleeding in the internal part of the eye known as the vitreous cavity. Vitreous humour is a clear gel that makes up two-thirds of the eye's total volume, consists 99 % of water and lies between the retina at the back and the crystalline lens and the ciliary body at the front. When there's a haemorrhage in the vitreous humour, this loses its transparency and light can't pass through it, causing the loss of vision. There are many possible causes of a vitreous haemorrhage, both spontaneous and due to trauma. 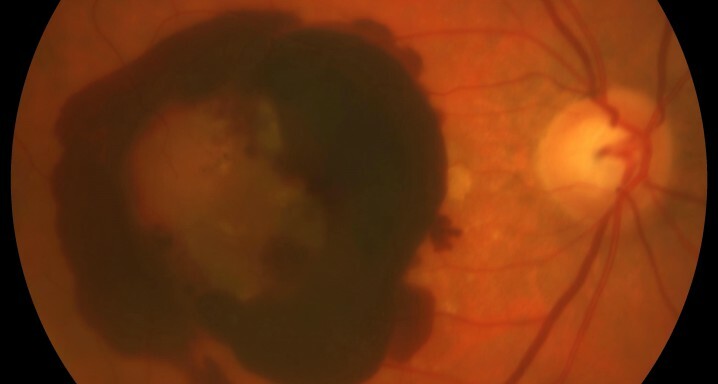 The most frequent cause is diabetic retinopathy (50 % of the cases), followed by rhegmatogenous retinal detachment, posterior vitreous detachment and central retinal vein occlusion. These are the causes of 95 % of the spontaneous cases. The main symptom is a sudden loss of visual acuity developing over the course of a few minutes. Depending on the intensity of the haemorrhage, loss of vision can be complete, with total or partial blindness. Sometimes, if the bleeding is slight, only blurred vision is experienced. As this is produced by a wide range of causes there is no single treatment for all patients. This must be individualised according to the origin of the haemorrhage, its severity and the patient's personal circumstances. If the haemorrhage is slight, it may resolve itself spontaneously and will only require the patient to wait, although complete sight may not be recovered for several months. On other occasions, after waiting for a period of time, a surgical procedure called a vitrectomy may be recommended, consisting of removing the vitreous humour via minimally invasive keyhole surgery. Depending on the cause of the vitreous haemorrhage, other treatments may also be required, such as laser procedures or the administration of intravitreal injections.